Inventory seemed to be one of retail's biggest challenges for 2009. After a very disappointing 2008 holiday season, retailers were left with too much inventory and Wall Street was paying attention. However, for much of this decade retailers have also been pursuing a counter-trend, if you will. That trend is localization. While economic conditions have forced retailers to slash inventories as quickly as possible, localization has caused them to rethink what the "right" level of inventory is to begin with. 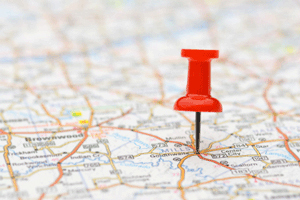 Localization is an offshoot of retailers' pursuit of customer centricity. In response to the power that virtual channels like eCommerce and mobile give to consumers in the retailer-customer relationship, retailers have been working hard over the last decade to increase their relevancy to consumers. On one side, that has meant more personalized communications and offers. On the other side, it has meant localization of inventory. At its extreme, localization of inventory means creating a custom assortment based on a store's unique characteristics and demographics. The reality of localization is a little less extreme: retailers on the leading edge of these initiatives have found that customizing 25-30% of the assortment by store creates an impression among consumers that the retailer has totally customized the assortment - the challenge is picking which 30% to customize. But another challenge has arisen from localization, and that is pressure on inventory levels. If you require that localization of inventory happens without increasing the retailer's overall level of inventory, the only way to do that is to risk an increased rate of stockout. Put simply, you're spreading the same amount of inventory over a larger number of SKU's. Something has to give. The biggest question regarding localized inventory has been exactly this - what will retailers give to get localized inventory, and is it worth it? Will they keep inventory levels the same and risk the customer experience in the form of stockouts, or will they increase inventory in the hopes that they sell more to cover the investment needed? The answer, according to RSR's latest research on inventory, is that winning retailers have placed their bets on increasing overall inventory levels (see Figure). 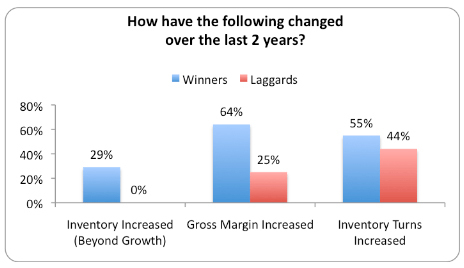 The bet has apparently paid off: winners also report improved margins and improved turns. How does this work exactly? By carrying more products that are relevant to specific customer groups (instead of averaging allocation across stores), these retailers are able to sell more inventory closer to full price - despite the initial investment required in terms of carrying more inventory. The key to achieving this, though, lies in the processes and technologies that support localization. If you have a supply chain designed for case-level flow straight to stores, for example, you're not just going to have to increase inventory, you're going to have to give up some distribution efficiencies to break packs and ship mixed cases. Retail winners are fully aware of these kinds of implications, and are positioning themselves now to deal with the process impacts of localization. To learn more about their challenges and priorities, you can read the full research report ("Precision Inventory Management in the Age of Localization") at www.rsrresearch.com.